Stocks finish modestly higher and Standard & Poor's places the credit ratings of 15 eurozone countries on negative watch after the close. NEW YORK (TheStreet) -- Stocks finished modestly higher on Monday although the major U.S. equity indices came off their session peaks in late trades on rumblings of a ratings outlook downgrade for European countries from Standard & Poor's. S&P later confirmed the reports, announcing after the closing bell that it's placed the long-term sovereign ratings of 15 eurozone members on "creditwatch with negative implications." 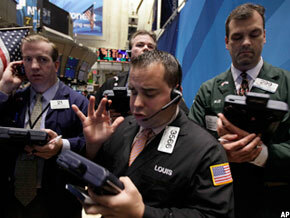 The Dow Jones Industrial Average settled up 78 points, or 0.7%, at 12,098. Financial stocks JPMorgan Chase ( JPM and Bank of America ( BAC led the gains for the blue-chip index, closing around 3% higher. The S&P 500 added 13 points, or 1%, to finish at 1257 and the Nasdaq Composite rose 29 points, or 1.1%, at 2656. More than 4 billion shares changed hands on the New York Stock Exchange and about 1.69 billion on the Nasdaq. "Today's creditwatch placements are prompted by our belief that systemic stresses in the eurozone have risen in recent weeks to the extent that they now put downward pressure on the credit standing of the eurozone as a whole," said S&P in its report, which impacted several triple-A rated countries. "Currently, we expect output to decline next year in countries such as Spain, Portugal and Greece, but we now assign a 40% probability of a fall in output for the eurozone as a whole." The rating agency says it expects to conclude its review on the eurozone sovereign ratings as soon as possible following the European Union summit scheduled for the end of this week. A negative outcome from the meeting could see ratings lowered by up to one notch for Austria, Belgium, Finland, Germany, Netherlands, and Luxembourg, and by up to two notches for the other governments. As Standard & Poor's placed the long-term triple A sovereign rating for Germany, the eurozone's largest economy, on its negative watch list, the rating agency said it's possible "these eurozone-wide issues could permanently constrain the availability of credit to the economy, Germany's economic growth outlook-- and therefore the prospects for a sustained reduction of its public debt ratio -- could be affected." Similar comments were made about the rationale for placing the long-term triple A ratings of the eurozone's second largest economy, France, and Luxembourg on the negative watch list. Greece wasn't included in today's S&P ratings watch. Stocks were positive early as investors cheered the likelihood of a unified European plan for budget and debt crisis control and shrugged off tepid U.S. economic data. After a meeting in Paris, German Chancellor Angela Merkel and French President Nicolas Sarkozy called for changes to the European Union treaty that would allow for stronger fiscal discipline, integration and budget alignment across the eurozone. They hoped the changes would be ready for approval by March. The two leaders agreed that any country whose deficit exceeds 3% of gross domestic product should be automatically punished. They also said that the introduction of Europe's permanent bailout fund should be moved to 2012 from mid-2013. Furthermore, they agreed that private investors should never again be asked to shoulder the burden of losses in debt-burdened countries, as they did during Greece's bailout. "Our wish is to go on a forced march toward re-establishing confidence in the eurozone," Sarkozy said. "We don't have time. We are conscious of the gravity of the situation and of the responsibility that rests on our shoulders." He said that while he and Merkel hope that all 27 members of the European Union would approve the treaty changes, they're also open to approval by just the eurozone nations and anyone else willing to join them. The announcement comes just a few days after European Central Bank president Mario Draghi stressed the need for a "fiscal compact" in the eurozone. Their proposals will be presented to the European Union summit taking place in Brussels this Thursday evening and continuing into Friday. The market expects that a consensus among leaders on coordinating tighter integration of fiscal and economic policies across the eurozone could lead to more aid from the ECB and International Monetary Fund. "The situation in Europe is likely to become worse before it starts to improve in order to generate sufficient pressure on the political process to achieve a credible solution," Royal Bank of Scotland analyst Brian Lancaster cautioned in a client note on Monday. Over the weekend, new Italian prime minister Mario Monti said his government approved a package of budget cuts worth 30 billion euros, or $40 billion, to prevent the country from toppling into bankruptcy. The leader was to present the plan on Monday to lawmakers, who are expected to vote on it in late December. On Monday, Citigroup analyst Timothy Thein said in a client note that "credit conditions in general stand out in the U.S. as being favorable, supported by the recent Fed survey showing continued modest easing." However, "Western Europe is in sharp contrast, as recent surveys show expected loan demand and overall credit availability at their worst levels in some cases since the fourth quarter of 2008." Economic data in the U.S. is light this week, and so far, lackluster. The Institute for Supply Management's non-manufacturing services index for November came in at a lower-than-expected reading of 52%. Economists surveyed by Thomson Reuters were expecting a print of 53.5%, from the 52.9% registered in October. U.S. factory orders fell a larger-than-expected 0.4% to $450 billion in October, after a 0.1% September decrease, according to the Census Bureau. Economists, on average, were expecting a fall of 0.3%, according to Thomson Reuters. "Today's domestic data, including ISM Services and factory orders, and the data over the balance of the week will no doubt take a back seat to European headlines, said Planned Financial president Frank Fantozzi. Germany's DAX settled ahead by 0.42%, and London's FTSE finished 0.28% higher. Japan's Nikkei Average settled 0.6% higher, and Hong Kong's Hang Seng Index closed up 0.73%. "Business confidence readings generally mirror current manufacturing trends, with U.S. and extended Asia surveys showing net optimism, while Europe and China sentiment has turned down," says Citigroup's Thain. In corporate news, Toyota ( TM rose 2.8% to $68.05 after saying it will begin, for the first time, to export U.S.-made Camrys. Initially, about 6,000 units will be exported through the Port of Hueneme, near Oxnard, Calif. The cars would be produced at Toyota's plant in Georgetown, Ky., the automaker's largest plant outside of Japan, which employs about 7,000 workers. SAP ( SAP plans to buy SuccessFactors ( SFSF, which provides cloud-based employee-management applications, for $3.37 billion. SAP, the German enterprise applications software giant, will pay $40 in cash for each share, a 52% premium to SuccessFactors' closing price Friday of $26.25. SuccessFactors shares surged 51.4% to $39.75. SAP fell 2% to $58.38. Commercial Metals ( CMC rejected a buyout bid of $15 a share, or $1.7 billion, from investor Carl Icahn. The bid undervalues the metals recycler and is "opportunistic," said Commercial Metals' lead director Anthony Massaro in a press statement Monday. Icahn had set a deadline of Monday for Commercial Metals to respond to his proposal. Shares of Commercial Metals were up 0.7% at $14.09. Dollar General ( DG, the discount retailer, earned 50 cents a share in the third quarter on revenue of $3.6 billion. Analysts were expecting profit of 47 cents a share on revenue of $3.57 billion. Shares added 1.6% to $40.58. Entergy ( ETR sad Monday it plans to divest and merge its electric transmission business with ITC Holdings ( ITC. Entergy is to get $1.78 billion under the deal, which is expected to close in 2013. Entergy shares jumped 4% to $72.39 and ITC shares rose 3.1% to $76.07. January oil futures closed up 3 cents to $100.99 a barrel, and February gold futures fell $16.80 to settle at $1,734.50 an ounce. The benchmark 10-year Treasury was down 0/32, raising the yielding to 2.037%, and the U.S. dollar traded sideways against a basket of major currencies including the euro, up 0.01%.